The MakeupEraser, Magic Mitt, Norwex microfibers washcloth. You can find much more by browsing the Internet. 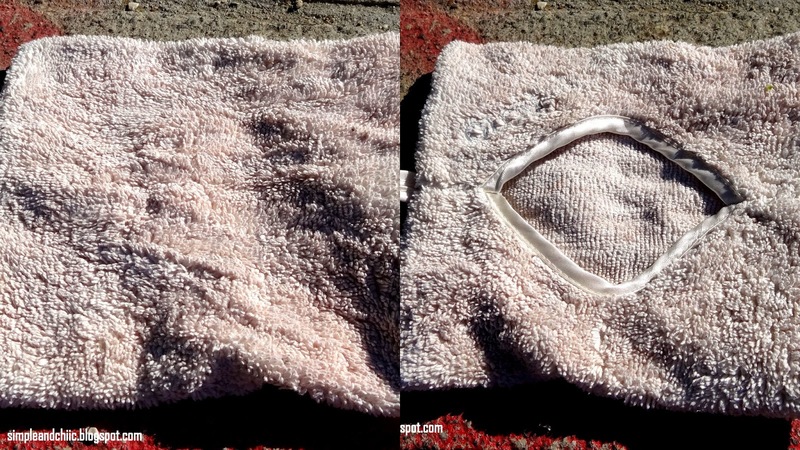 In this post I am going to review this GLOV product in particular but I think that many of the things I have to say here can be said for other microfiber tools. GLOV is a makeup remover glove which has the shape of a square. In the back you have a hole so you can insert your hand in it. You have to wet it and then glide it slowly onto your face without using any product. Water and GLOV is all you need. Your makeup will stick to the specific fibers which are 30 times thinner than a cotton pad and 100 thinner than a human hair. This product also has exfoliating properties. At the exception of 2 of my beauty products, this cloth really works. With water only I was able to remove easily masks , everyday makeup and heavy makeup. It also removes very long lasting mascara easily. I did find the process easier and quicker when I was using warm water. Although the fabric is soft you do feel the exfoliating properties on your face. You can hand wash the cloth with a cleanser and warm water and it is not too difficult. The brand states that this product should be efficient for 3 months and keep antibacterial properties for 3 months as well. The other good thing is that you can save money as you don't need to use an other product with this glove. You also do an ecological gesture as you don't need to buy cotton pads anymore. You always have to clean this product even when you are in a rush if you want to be able to use it the next day. If you have big hands like mine you will find the opening in the back and the size of the glove too small. I am not sure that someone with dry and sensitive/fragile skin type will enjoy the exfoliating feelings on a daily basis as it can feel a little bit harsh/drying. During the first weeks of usage I had no problem with this glove. It was really good until I tried to remove my favorite long lasting foundation with it. It was more difficult than usual to remove it from my face and when it was finally done I had issues washing the foundation stains off from the glove. The next day with my not so clean glove I decided to remove a new pink clay mask with it and once again it was difficult to remove it from my face and then very difficult to remove the pink residue from the glove. At the end it was not looking so clean, so I decided to clean it thanks to my washing machine at 40°C as indicated by the brand. As a result my cloth was just looking a little a bit cleaner. When I used it again I noticed that it was not as efficient as it used to be. Removing all my makeup became difficult and time consuming so it was impossible for me to test out this product during its lifetine that is supposed to be 3 months. I had bought 2 of this products so I am now planning on using the second one. This time I am not going to use my favorite long lasting foundation or my new pink clay mask, and I am going to try to avoid washing it in the washing machine and see what happens.